HopesHaven has their our own Domain now!! Please Click Here to go to the REAL website. Prayers for Hope of Hope's Haven Needed!! This is Hope's Haven's 3rd Annual Fundraising Calendar! It's been another very successful year for our great calendars! Thank you to all who supported and bought one. No more Calendar orders will be taken after 10/31/05, but be sure and keep your eyes open for 2007 calendar dates!! Hope's Haven is a friendly rescue where we attempt to help people to keep their dogs through education, as well as taking in dogs in need that are looking for forever homes. Chinese Crested Dogs, Xoloitzcuintli (Mexican Hairless), American Hairless Terriers and any breed of hairless dog (and their coated counter parts! ), are among the breeds we rescue. We understand life changes and the many reasons why someone may have to turn their dog into rescue. We are not here to judge, we are here to help. We are comprised of individuals that donate their time and money to provide loving foster homes until a suitable forever home can be found. This is not a rescue where dogs are in kennels or lined up in crates. Every dog in foster care is a part of that family and treated the very same as they treat their own dogs. All volunteers are approved through a screening processes to ensure that they will provide a safe and happy home while the dog is in foster care. If a dog needs a home where someone is present almost 24/7... that is what we will find. If a dog needs a home without children, we will make sure that is what happens. We want every adoption to be a successful one, so we take every precaution possible to match a dog with just the right home. Take a look around Hope's Haven, and do not hesitate to contact us if you have any questions or need assistance. Please note: this is a rescue and we do not purchase dogs from owners or breeders. They will donate 15% to us if you purchase through this link!! They will donate 10% of commissions to Hopes Haven on all pet food items and 15% commission on all other, non food items, so please purchase through our link, thank you! We are very excited about this! Rebecca at 'Down Home Doll Patterns and Dolls' started making Chinese Crested Dog dolls that were originally patterned after one of our rescue dogs, Eno. She is going to offer patterns for the dolls and also completed dolls for sale and donate a percentage to Hope's Haven from each sale off our website. "Down Home Doll Patterns & Dolls" is now offering Chinese Crested Dog Doll Patterns & Dolls and will donate a percentage to Hope's Haven from every sale made from our site! Rebecca from Down Home Doll Patters & Dolls has already sold several dolls & patterns!! ** Click here to see the Chinese Crested Dog Dolls that Rebecca has already made for Chinese Crested lovers and owners!" Rebecca is going to donate 10% of the sales of all *completed* dolls that are on her site! Customers just need to note "Hope's Haven" in the comment box when buying. 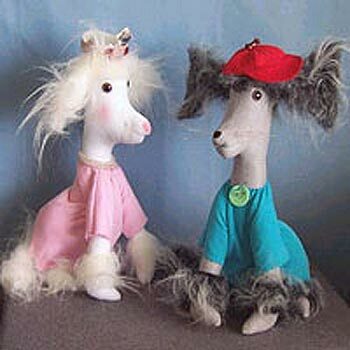 Click here to view and order a Chinese Crested Dog Doll Pattern & to order already made dog dolls! - Click here to order yours at our brand new HH Online Shopping Place!! Shop using iGive with Hope's Haven as your designated charity and we will recieve a percentage of the total amount you spend!! Patented Kuranda Dog Beds are durable, chew proof and easy to clean. 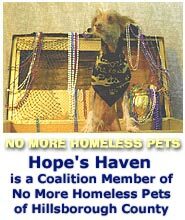 If you would like to donate a bed to Hope's Haven to help keep the foster dogs comfy, click here. 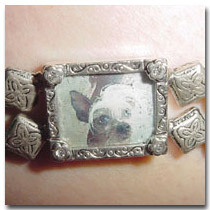 If you purchase any of these lovely charm bracelets please be sure and specify our rescue "Hopes Haven RESCUE" and we will receive 30% of your total amount! Photo courtesy - Keep That Thought Studios, featuring our own Laverne (adopted)!